In 2017, Artemis began offering sustainable investing as an option for interested clients. Our approach is fully aligned with our overall investment philosophy and focuses on utilizing low-cost investment vehicles that have been screened for environmental, social and governance (ESG) criteria. Often people are surprised when, during client meetings, we ask them about what matters to them, and if they want us to take -what they identify into consideration as we build out their financial plan and investment portfolios. To illustrate our commitment to sustainable investing practices, Artemis is always looking for ways to educate investors and partners with like-minded organizations seeking ways to make a greater impact through investment. 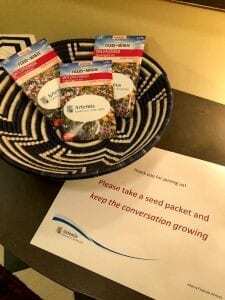 “The Rise of Sustainable Investing” was our first Cocktails and Conversation event topic. The event was both well attended and well received with a great diversity of attendees. Some guests were just learning about sustainable investing for the first time while others were leading experts in the field. 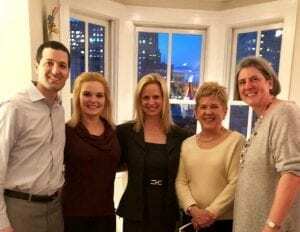 Lenore Reiner from Calvert Investments fell into the latter category and was our guest speaker for the event. Lenore is a recognized leader in responsible and sustainable investing who shared with us Calvert’s view that companies are increasingly addressing ESG factors as part of their strategic and operational decisions. Firms that perform better in some of those factors subsequently have better financial performance, she explained. You can read more about Calvert’s Four Pillars of Responsible Investing here. Interest in sustainable investing is certainly growing as investors recognize the many benefits this approach offers. “Assets under management in U.S.-based socially responsible investing strategies climbed to $8.72 trillion at the start of 2016, roughly 20 percent of all investment under professional management and an increase of 33 percent from the start of 2014.” Those numbers — published every two years by US SIF: The Forum for Sustainable and Responsible Investment, a Washington, D.C., trade group whose members include numerous mutual and pension funds — are likely higher given the growing interest in the space. 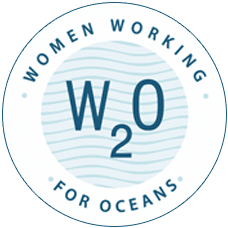 Last year, I got involved with a terrific organization, Women Working for Oceans (W2O), whose mission is to educate and advocate on the challenges facing our ocean, and inspire individuals to take action to ensure a healthy, sustainable blue planet for tomorrow. In honor of Earth Day this year, W2O hosted a panel on Investing with Impact, which I moderated. We had three prominent leaders in the sustainable investing space (Wendy Holding, trustee and partner at Loring, Wolcott & Coolidge; Katherine Collins, head of sustainable investing at Putnam Investments; and Andy Mims, trustee and partner at Loring, Wolcott & Coolidge), who discussed current trends, common myths and the evolution of sustainable investing, and a more general discussion on the power of investment to drive social change. At Artemis we offer sustainable investing options because we have long believed that clients should be able to express their values through their investment decisions. In our most recently quarterly report, Leigh Bivings, CEO of Artemis, discusses some “thematic” investing opportunities that we have started to offer for Artemis clients for their portfolio. “The basic premise of thematic investing is that in an increasingly globalized world, what is more important is investing in the companies and sectors that will benefit from the structural changes facing the global economy. These global trends will provide opportunities to investors who can take a longer‐term view,” writes Leigh. Some of the themes we are watching include: water technology, industrial automation/artificial intelligence, gender diversity, power infrastructure/smart grid and sustainable transportation.